If you are late to the game in making your New Year’s resolutions, I have an idea for you: Don’t do it. New Year’s resolutions may be as old as the Babylonian empire, but that doesn’t mean they are very effective. Millions of Americans make New Year’s resolutions every year, but research says most of us are wildly unsuccessful. Many of us only stick it out for a while. A quarter bomb in the first week. A third don’t make it past the first month. Fewer than half are still plugging away after six months. Fewer than 10 percent of us are actually successful. Our resolutions concern our health, wealth, relationships, and personal development. In other words, they’re about the things that matter most to us. I’m sure you have your own personal stories of starting the New Year strong only to get busy, fall behind, and eventually lose motivation. It’s happened to me. And it’s exactly why I don’t bother making New Year’s resolutions anymore—at least not the usual kind. When I think of my health, my family, my spiritual life, and my business, I know some dreams are just too important to entrust to a faulty system. Instead, I utilize a proven goal-setting process that incorporates safeguards for many of the pitfalls and failings of typical resolutions. It’s taken me years to develop this process, and I’ve seen it work not only in my own life, but also in the lives of countless people with whom I’ve shared it. Some people will say that the best way to make our resolutions stick is to only pick one or two for the year. But that’s leaving far too much on the table for me—and probably a lot of you, too. We’re talking about the things that matter most, right? Why leave so many things undone and miss so many opportunities to grow? Instead of cutting back, we just need to use a system that actually works. 1. Genuine possibility. Unless we believe we can reach our goals, we’re sure to miss. The number of people in their twenties who achieve their resolutions is far greater than those over fifty (39 percent to 14 percent). Why? The greater the number of setbacks we’ve experienced in life the less likely we are to believe we can prevail. Doubt is a goal-toxin. To reach our goals, we need to trade these limiting beliefs for liberating truths. To reach our goals, we need to trade our limiting beliefs for liberating truths. 3. Effective design. Part of the problem with typical New Year’s resolutions is that they’re poorly designed. “Lose weight” or “Make better financial decisions” fail on several counts. Among other things, effective goals are specific and measurable. Goals poorly formulated are goals easily forgotten. 5. Proven tactics. Finally, resolutions fail because we’re missing proven implementation tactics. Winning a battle takes both strategy and tactics. But unless someone shows us what works best for attaining our goals, we’re left to luck or hard knocks. No wonder it sometimes takes us five or six years in a row to finally achieve an important resolution. Life’s too short for typical New Year’s resolutions almost guaranteed to fail. The good news is that you can shortcut the hard knocks, stop counting on luck, and finally succeed. 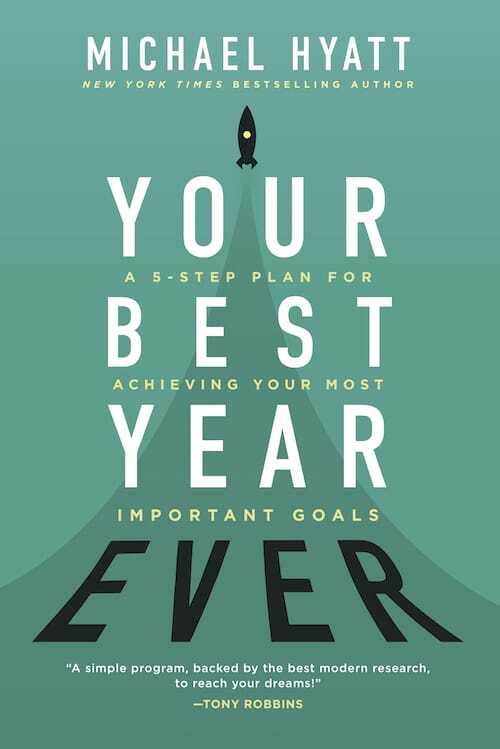 My new book Your Best Year Ever comes out today. Based on the proven goal-setting process I already mentioned, it’s specifically designed to address these five dimensions of goal-attainment. Depending on how important your resolutions are to you, this could be the most important book of the new year for you. Ask yourself: What would my life look like twelve months from now if I reached my most important goals? Order Your Best Year Ever now and you can leverage my proven system for yourself. You’ll discover how to overcome your past setbacks, design goals that actually work, and achieve more than you thought possible in 2018. And if you buy this week, you can get over three-hundred dollars’ worth of free bonuses. Check it out here.